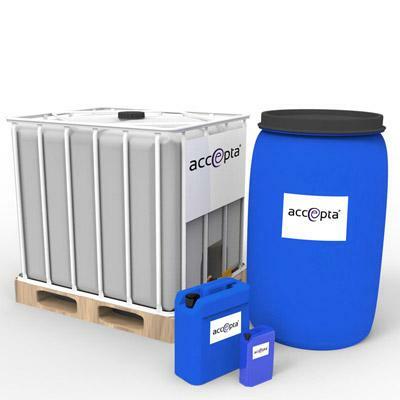 Accepta 0030 is a new and highly advanced water treatment scale and corrosion inhibitor formulated using both anodic and cathodic site pacifiers. Accepta 0030 is scientifically formulated to protect systems containing ferrous metals, copper, copper alloys, zinc and aluminium. Accepta 0030 will control both ferrous and non-ferrous metal corrosion at elevated temperatures and under a variety of water conditions and flow velocities. Accepta 0030 provides protection to systems containing ferrous metals, copper, copper alloys, zinc and aluminium by utilising a blend of powerful inhibitors operating at a neutral pH. Highly advanced scale and corrosion inhibitor formulated with both anodic and cathodic site pacifiers. Maximises boiler efficiency by reducing scale formation in the boiler heat exchanger. Accepta 0030 is dosed at a rate of 1% of the system volume. For best results, it is advised that untreated or dirty systems are chemically cleaned and flushed before treatment. A simple test kit is available to monitor, control and maintain correct levels of Accepta 0030 in the system water.